When deciding what laptop to buy, one of the first decisions you’ll have to make is whether or not you want a touchscreen. For a lot of people, the idea is pretty pointless – after all, we’ve been using laptops for decades now, and we’ve been doing fine with just keyboards and trackpads. That’s where the idea of a 2-in-1 comes in. It’s not just about touching the screen, but using your computer in new and different ways. Of course, whether or not this adds anything to your life depends on the physical design and the software of the device in question. 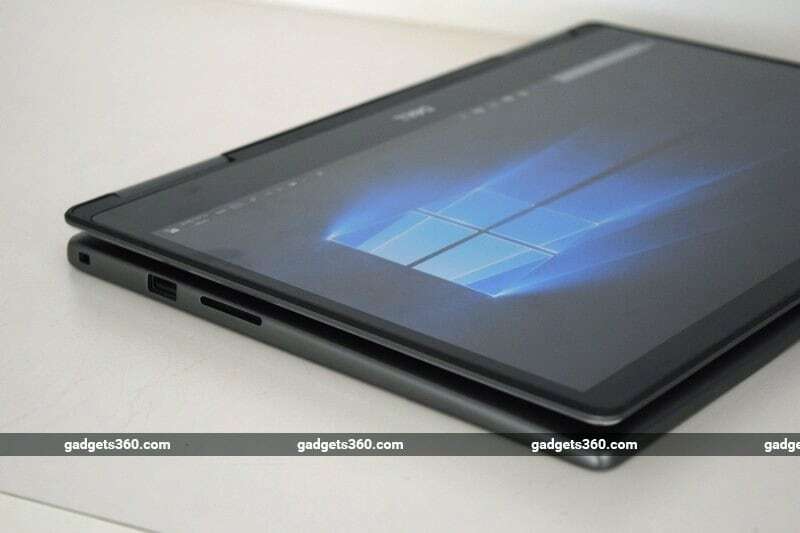 2-in-1s come in many different shapes and sizes – some are more tablet while others are more laptop – and for this reason, some are more versatile while others don’t really manage to deliver the best of both worlds. Dell, for example, offers standard and 2-in-1 versions of many of its consumer models. 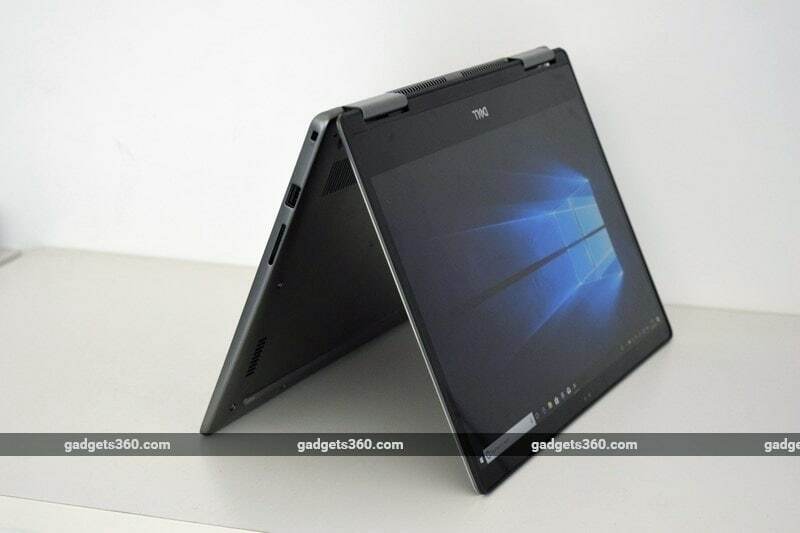 The new Dell Inspiron 13 7000 2-in-1 might not be the slimmest or lightest option around, but it’s trying to be an all-rounder that will entertain you but also let you get work done. Let’s see if it manages to do that successfully. The Inspiron 13 7000 2-in-1 has a dark metal body, which Dell calls Era Grey. The company hasn’t done anything new or interesting with textures, shapes or lines, and the overall look is quite sober – unremarkable, but still good-looking. The only real bits of design flair are the chamfered edges around the lid and the trackpad, but even these are quite subtle. If you bump this device into anything when carrying it around, those shiny edges will get scuffed. The lid folds all the way back so that you can use this 2-in-1 as a tablet. The keyboard deactivates when it’s flipped over backwards, but the two halves of the device aren’t detachable so it’s still quite bulky and heavy. You’ll be able to use this device in tablet mode when sitting down or lying back, but you can’t comfortably hold it in one hand thanks to its 1.45kg weight. Many 2-in-1s have power and volume buttons on one side so that you can get to them easily in any mode, but the Inspiron 13 7000 lacks physical volume buttons. You have to reach for the touchscreen which isn’t super convenient with full-screen media playing. The power button is on the keyboard deck and is a bit too easy to hit accidentally when picking the device up in tablet mode. You also don’t get a stylus, but thankfully the two halves lie flat against each other and there’s no bouncing or flexing when using the touchscreen. The hinge feels pretty strong, but unfortunately the lid wobbles a lot when tapping the screen in laptop mode. If you don’t need the keyboard and trackpad at all you can also prop this devce up in “tent” mode which is a lot more stable. The stereo speakers are on the bottom and thankfully aren’t muffled no matter what position the device is in. Dell claims that the Inspiron 13 7000 2-in-1 has narrow screen borders, but this is no stylish XPS series model. It’s only the two sides that feel narrower than usual. There’s enough space up top for a webcam as well as an infrared sensor that enables Windows Hello face recognition. Below the screen is an enormous chin with a shiny Dell logo. The main problem with this is that both the screen and the frame around it are extremely reflective, and while you can pump up the screen’s brightness, you can’t do anything about the thick black borders. Every single fingerprint and smudge is clearly visible too. This can be very distracting when watching videos or trying to work. The keyboard keys feel just a little bit smaller and more spaced out than usual, and it took us a little time to get used to this but we were soon typing at our usual speed. Thankfully the layout isn’t cramped and nothing is out of place. The arrow keys are squashed together, but not too difficult to use. There are all the usual media shortcuts and two levels of white backlighting to choose from. The trackpad is large and very easy to use, with a satisfying mechanical click. We have to note that that the edges of the keyboard deck, where the flat inner surface meets the sides, are a bit too sharp. We found it uncomfortable to rest our wrists against the front lip when typing. In tablet mode, the inside of this device becomes the outside, and so just picking it up means that you’ll feel the roughness against your palms. This surprised us quite a lot, because Dell usually pays attention to such details. 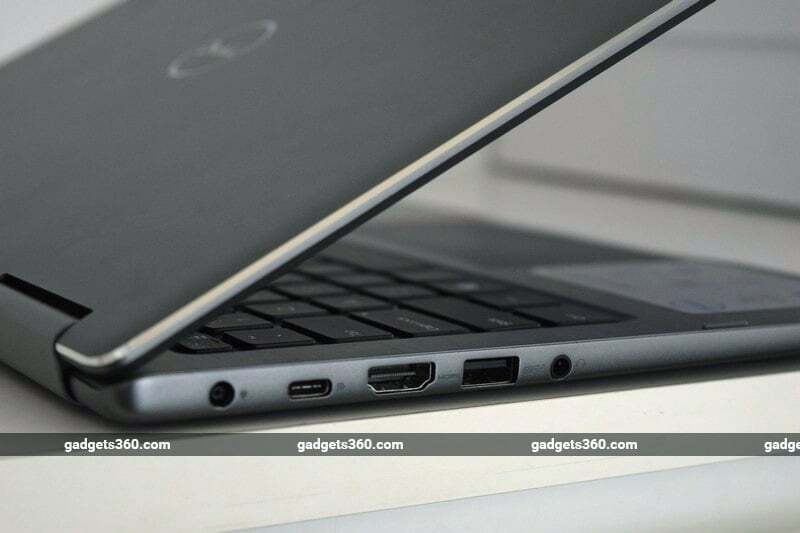 Dell sells two versions of this device in India. Our review unit had an 8th Gen Intel Core i7-8550U processor, 16GB of RAM, and a 512GB solid-state drive. If you choose to step down to a Core i5-8250U CPU, you’ll also get 8GB of RAM and a 256GB SSD. What both variants have in common is the 13.3-inch full-HD touchscreen, 38WHr battery, and Infrared camera. The Inspiron 13 7000 2-in-1 is as thick as most laptops and has enough space for a variety of useful ports. On the left, there’s the power inlet, a USB Type-C (3.1 Gen 1) port, an HDMI 2.0 port, a standard USB 3.1 Gen 1 port, and a combo audio socket. On the right, there’s a security slot, another USB 3.1 port, and an SD card slot. There’s also dual-band Wi-Fi 802.11ac and Bluetooth 4.2. 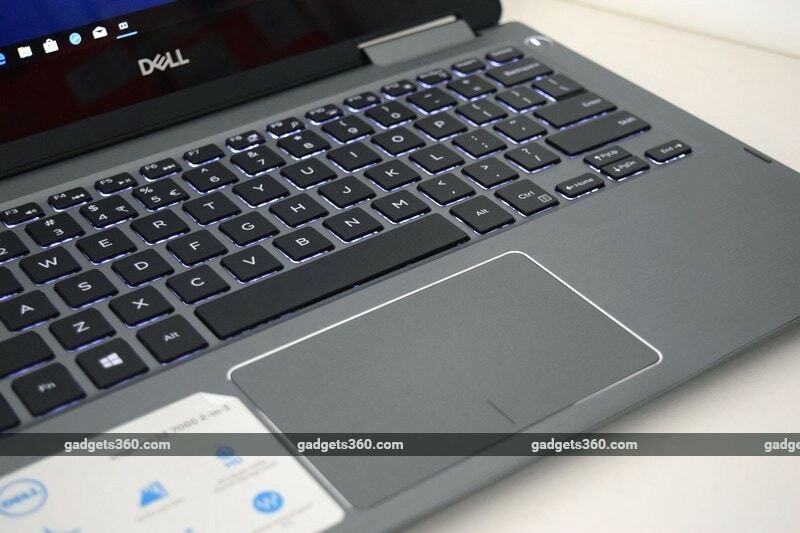 Dell ships this laptop with Windows 10 Home and a 30-day trial of Microsoft Office 365. There’s also a 15-month subscription to McAfee Multi Device Security. Our review unit showed us a huge notification advertising 20GB of free Dropbox space for a year, and it kept popping up after every reboot. Similarly, Dell’s own management utility displays popups that are impossible to dismiss permanently, and you have to install every update (or prevent the program from running in the background, which we were sorely tempted to do). There’s also a Dolby Atmos Access app, but on running it we learnt that we were expected to pay Rs. 974 to enable Dolby Atmos for Headphones, which seems a bit ridiculous. As a buyer, we’d be considerably annoyed to see this after just having paid nearly Rs. 1,00,000 for this device. Dolby Atmos for Home Theatre is available without charge, but requires suitable speakers or a soundbar. Performance as a laptop was pretty good in all kinds of everyday situations. We were able to get up and running in no time. We played assorted media files, streamed some video, and did a lot of browser-based work without any trouble at all. The screen made colours appear a bit muted, but photos and videos generally looked quite good. We had no complaints with the viewing angles. Videos looked fine but sound from the speakers was hollow and a little scratchy at high volumes, and our music didn’t sound great at all. Windows Hello face recognition worked quickly and required zero effort from us. As a tablet, it definitely isn’t the most comfortable, and the 16:9 screen isn’t ideal for use in portrait mode. The lack of a stylus means that we couldn’t take advantage of a lot of tablet-specific apps for sketching and note-taking. Still, we swiped through a few webpages and tried a few touch-optimised games from the Windows Store. Speaking of games, that’s one thing you won’t want to do a lot of with the Inspiron 13 7000 2-in-1, thanks to the low-power Intel integrated GPU. Rise of the Tomb Raider gave us less than 10fps using the Low quality preset, and the Unigine Valley benchmark averaged only 16.9fps. On the other hand, general performance was quite strong. PCMark 10 scored 3,771 points, and Cinebench R15’s single- and multi-threaded tests gave us 161 and 530 points respectively. Compressing a 3.24GB folder of assorted files took 3 minutes, 22 seconds, while transcoding a 1.36GB AVI file to H.265 took 1 minute, 50 seconds. The Inspiron 13 7000 2-in-1 didn’t get uncomfortably hot in use, but we could definitely hear the fans spin up when anything stressful was happening. Hot air is exhausted out the back, where the hinge opens out, and you can hear it like a small jet when the fans are running at top speed. Battery life is not very exciting. We were able to get just about seven hours of light everyday use out of this device, but we would have liked more. The more demanding Battery Eater Pro test ran for only 1 hour, 21 minutes. The Inspiron 13 7000 2-in-1 is quite expensive. The higher-end spec that we tested sells for Rs. 96,190, while the Core i5 variant is still premium at Rs. 76,290. At this level, you can buy some extremely portable and capable laptops including Dell’s own Inspiron 13 and XPS 13 models. There isn’t a lot that capitalises on the touchscreen and 360-degree hinge. Sure, it’s easy to get used to tapping buttons on the screen instead of reaching for the trackpad, but that isn’t essential functionality. To decide whether it’s worth prioritising 2-in-1 functionality, you have to know what you want to do with your next computer, and how and where you’re going to do it. That aside, the Inspiron 13 7000 2-in-1 has up-to-date specifications and it balances productivity with entertainment. It’s relatively portable and stylish with only a few rough edges – figuratively and literally. If you’re specifically choosing a 2-in-1 over a regular laptop, this one is worth considering.